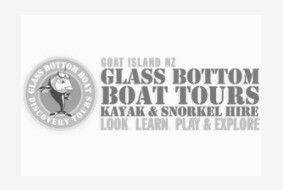 Look, learn, play & explore with Leigh's #1 attraction: The Goat Island NZ Glass Bottom Boat Tour! Peer through the boat's glass bottom and view an array of fish swimming through the abundant kelp and seaweed forests, spy eagle and sting rays as they glide over the sand, and see other types of marine life nestled among the reefs. Above ground, breathe in the salty air as the boat tours the marine reserve, with its mysterious caves and the sea-battered rocky cliffs of Goat Island. And keep your eyes open for the dolphins, seals, penguins, whales, orcas and sharks as they occasionally pass through Goat Island Marine reserve! Direct boarding from the beach allows guests to stay dry throughout the entire journey - making it a perfect activity during any season! Trips are dependent on weather and sea conditions. Trips may not be suitable for toddlers or people who suffer from motion sickness. The boat is boarded via an easy access ramp and allows safe and dry embarking and disembarking directly on the beach at Goat Island Marine Reserve. Hire masks, snorkels, fins & wetsuits to get a fish-eye's view of the reserve. You must be able to swim and be competent in the water to hire snorkel gear - if not, please see our guided snorkelling packages. All safety equipment is provided at no additional charge. Hire one of Goat Island NZ's kayaks and paddle above the reefs and marine life at your leisure! Hourly hires are available, and tutorials are offered for beginners. Safety equipment is provided at no additional charge.